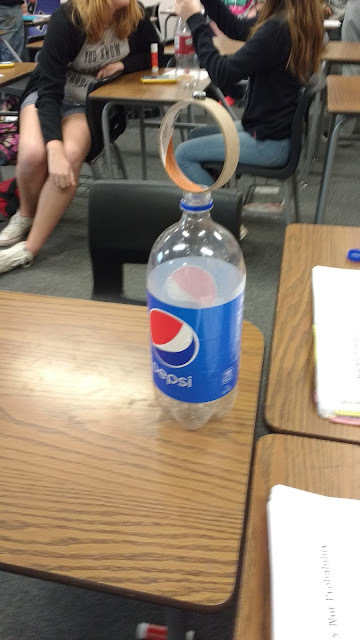 One of my favorite activities from the Steve Spangler workshop I attended was an inertia challenge involving a 1- or 2-liter bottle, a plastic ring, and a hex nut. Steve Spangler also sells a kit with all of the supplies for this activity. I attended his workshop in the hopes of finding ideas for my physical science class, but I ended up walking away with more ideas that I could use with my Algebra 1 classes than my science class! If you're looking for a deal on science-y stuff for your classroom, there's currently a coupon code for 10% of your next order! The premise of this activity is to remove the plastic ring which causes the hex nut(s) to drop successfully into the bottle. 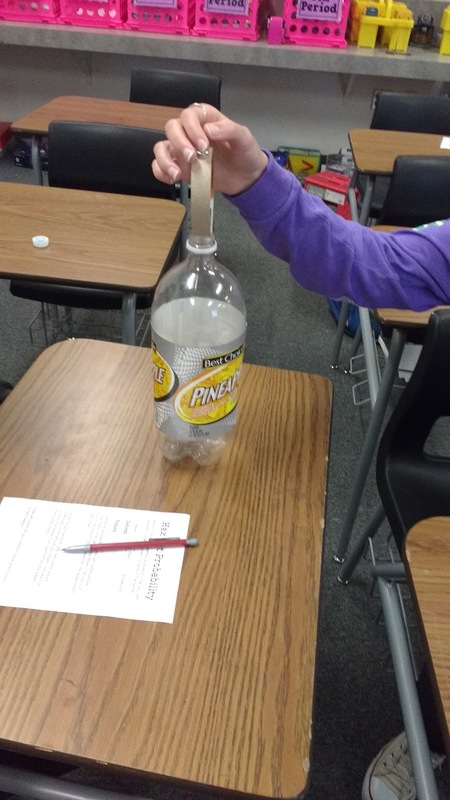 Though I loved this idea, I wasn't planning on using it with my students this year because physical science has already finished discussing force, motion, and inertia. My Algebra 1 students, on the other hand, are currently studying probability. 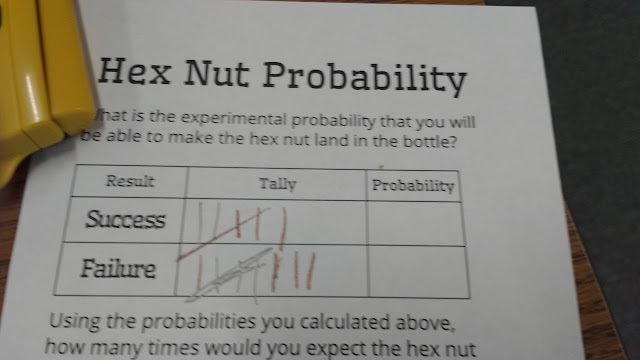 I was looking for a fun way to get my students collecting some data to find experimental probability when I remembered this activity. My husband and I had both attended Steve's workshop, so I had two of the plastic yellow rings in my classroom. 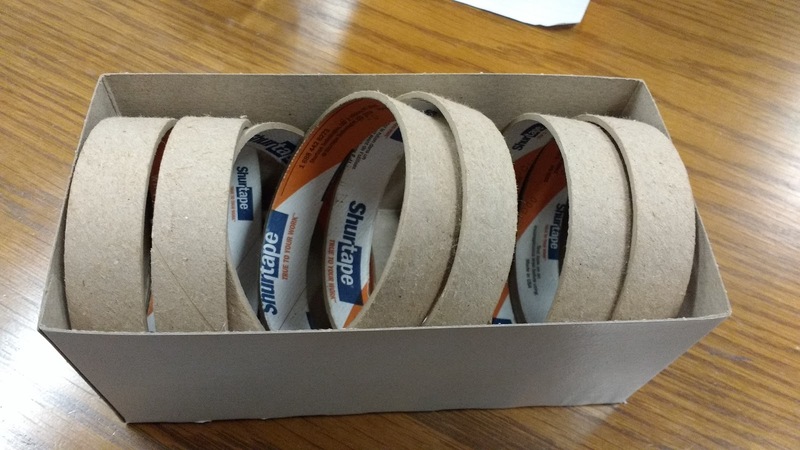 My parents own their own business and do a lot of shipping, so I had asked my mom to save tape roll cores for me. I set out the supplies for my students. 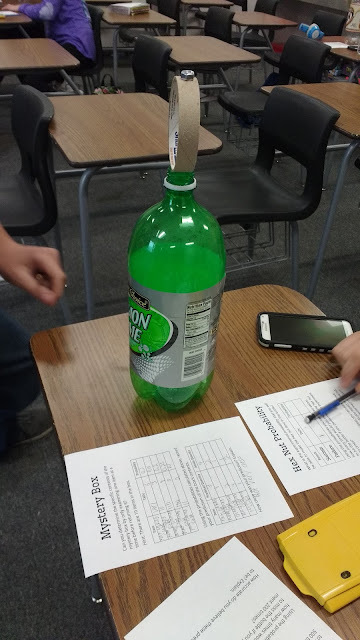 I demonstrated for my students how to set up the bottle, tape roll core, and hex nut, but I intentionally did not demonstrate how to perform the activity. I wanted my students to figure this out for themselves! 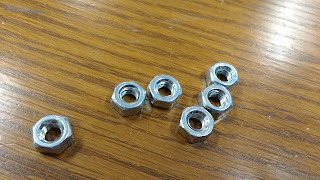 I only had six hex nuts, so I had students break up into six groups for this activity. 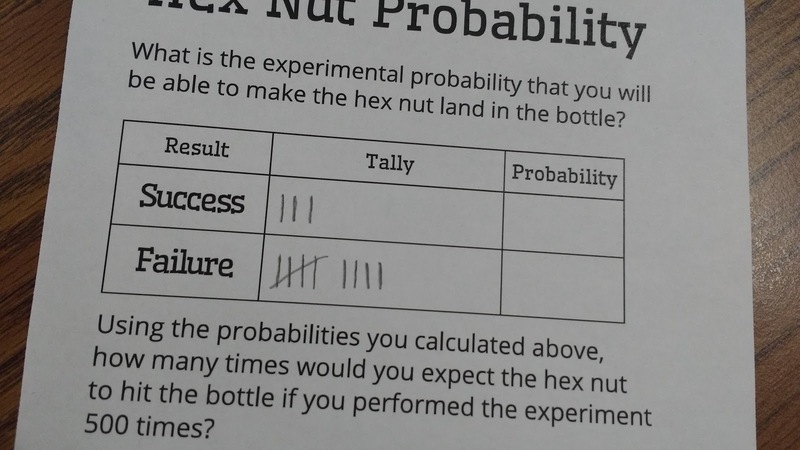 Each time a student performed the experiment, he/she had to record whether the hex nut fell into the bottle (success) or whether the hex nut missed the bottle (failure). Then, I set them free. Many of my students found this to be a very tricky task! Here are a few videos I took of my students in action. If you are reading this in a RSS reader, you may need to click through the link to see the embedded videos. Other students were more successful. 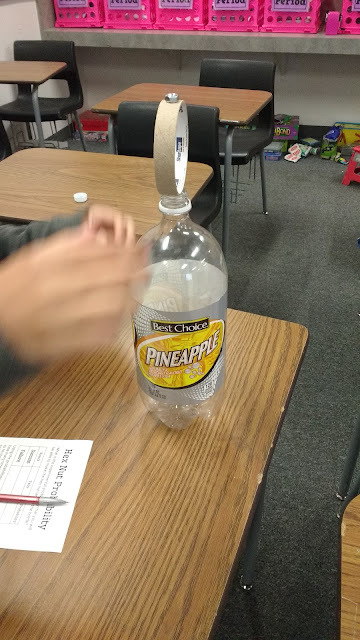 One of my students, much to the dismay of his classmates, succeeded EVERY single time. I took a video of him explaining his strategy to his peers. Apparently, it's all about the "scoop." After giving students five to ten minutes to collect their data, I had students clean up their supplies so we could calculate our experimental probabilities of succeeding and failing at landing the hex nut in the bottle. Then, we used these probabilities to make predictions. 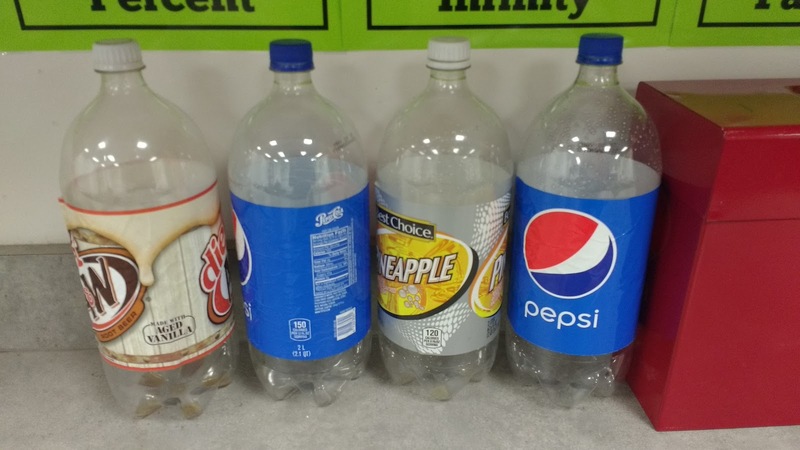 There were mixed results when I asked my students to critique their predictions. In some classes, some students pointed out that the probability would change with more experience. They noted that they had improved greatly just after ten to fifteen attempts. After 500 attempts, they should be much better! In another class, the students thought that the prediction was incorrect because they would likely get bored after 500 attempts and stop trying as hard. Both interesting lines of thinking! My kids LOVED this activity! Our principal walked in as I was preparing to intro this activity, and he had a very confused look on his face. We gave him the opportunity to try it for himself. He missed both times. I've uploaded the notebook page I created for this activity here. Teaching probability is turning out to be a lot of fun! Five or so years ago before I ever started teaching, I purchased a hula hoop at a yard sale. I paid a whopping 10 cents for it, and I just knew it would make the perfect addition to a math lesson! My initial idea was to use it in a ratios and proportions lesson, but that never happened. Instead, it spent most of its life hanging out between a wall and a filing cabinet. 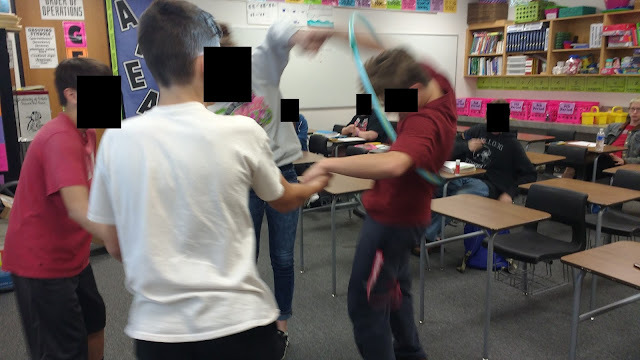 This year, though, it made its classroom debut in a hula hoop relay race for one of our lessons on scatter plots. 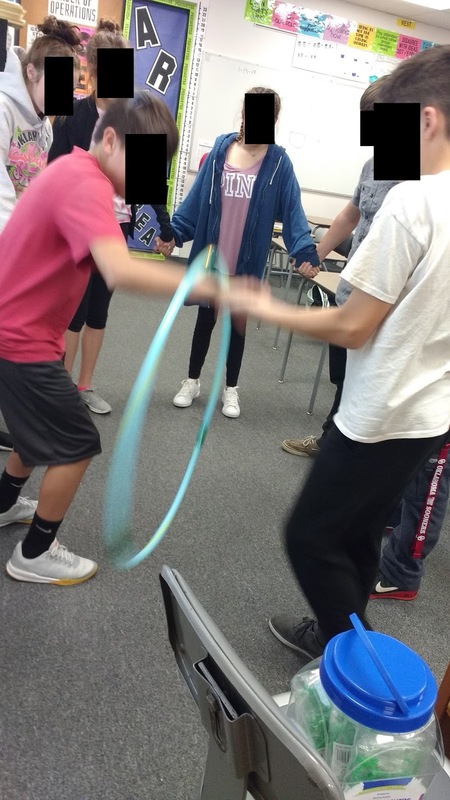 Hula hoop relays are often used as team-building activities. The main idea is that all of the participants join hands to form a large circle. A hula hoop must be passed around the circle which each player stepping in and out of the hula hoop to pass it to the next person. Hands must stay interlocked at all times. Still confused? I found this description and illustration of the game. I prepared a note-taking sheet for my students to glue in their interactive notebooks. First, I had them make a hypothesis regarding the length of time it would take to do a hula hoop relay with our entire town. Their answers ranged anywhere from a couple of hours to a couple of months! There was much disagreement! 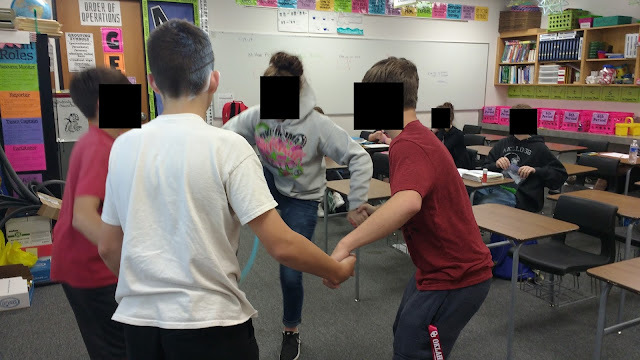 After determining that our independent variable was number of people and the dependent variable was time, we started collecting data with different numbers of people in the circle. My kids had a TON of fun with this! 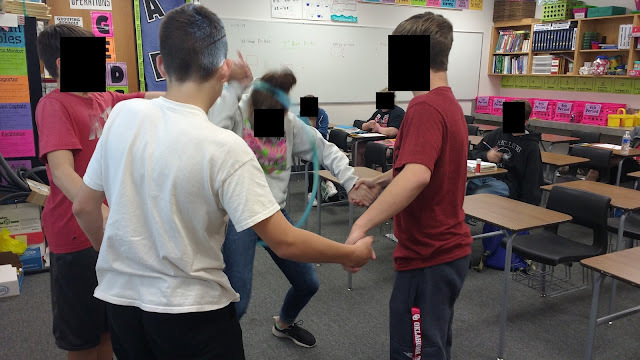 I make it a policy to never include photographs that show students' faces on my blog or twitter, but I have to say it was hard to hide their faces in these photos. There was just an expression of pure joy on each face. They were grinning from ear-to-ear in math class. You can't beat that! Here are some action pictures. This was a really hard activity to photograph because there was constant motion! After collecting what the class decided to be a sufficient number of data points, we made a scatter plot of our data. We used this scatter plot to find a line of best fit by hand. Then, we used the equation for this line of best fit to determine how long it would take us to do the hula hoop relay with the entire town. There was some debate about the size of Drumright. One student did a bit of googling and found that the population in 2014 was 2883. One student insisted that this data was out of date. The population of Drumright was now 5,000. Another student insisted that this data could not be right at all. She thought that the town only had a population of around 600. I found these conversations to be very interesting. Eventually, the class did decide to use the data value from 2014. 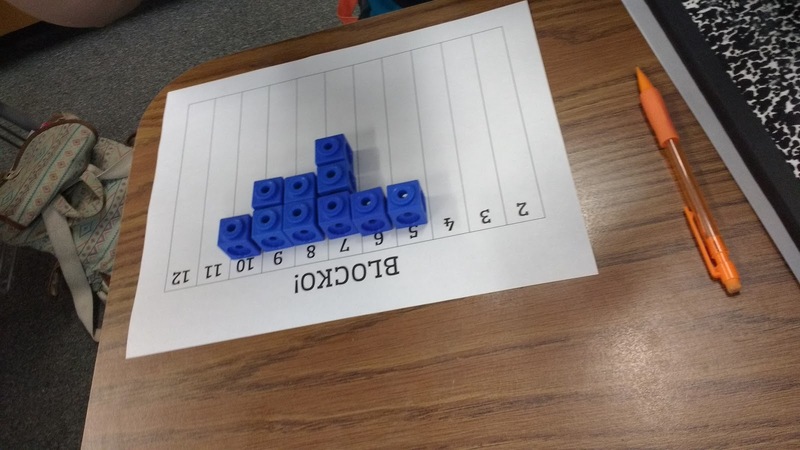 I was surprised by how different the results were from my two classes that did this activity. The first class ended up with an estimate of 2.5 hours for the entire town to complete the relay. The second class really struggled with the hula hoop relay. 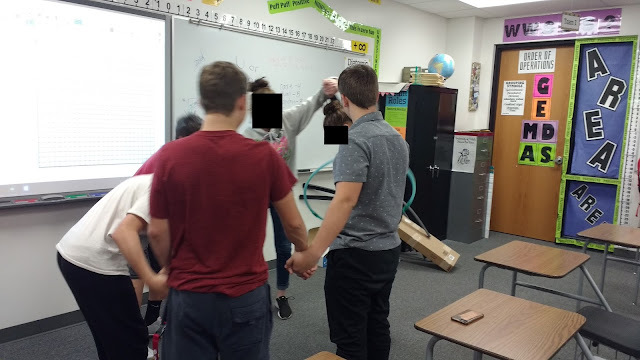 I think this was probably due to the fact that there was a BIG difference in students' heights in the circle which made it much trickier for them to complete the relay. They ended up with an estimate of over 7 hours for the entire town to complete the relay. I LOVED the discussion that resulted from asking my students to rate the trustworthiness of their model and estimate. 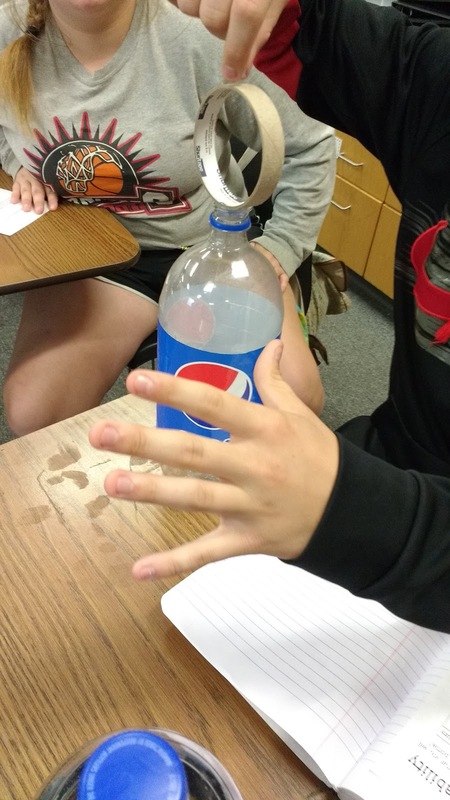 Students were eager to point out potential problems. What about the elderly? They wouldn't be able to bend over enough to get through the hula hoop. What about people in wheel chairs? Then, we started talking about how it would work with kids. Kids up to a certain age would be able to just step through the hula hoop without any issue at all. I definitely look forward to using this activity again in the future! Files for this activity are uploaded here. When I dreamed up this activity, I envisioned myself using a box. Therefore, I typed up the notes as "Mystery Box Probability." 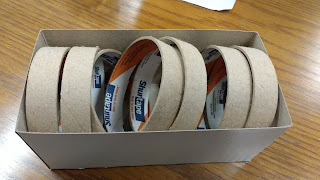 Then, my husband ended up borrowing the box I planned to use for an activity with his geometry classes. I happened to notice a bucket on top of the shelf that I purchased a few summers ago at Dollar Tree. 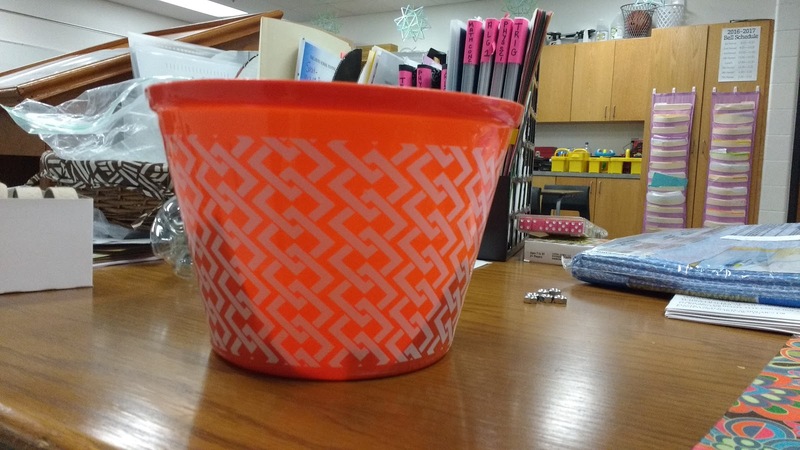 And, that's the story of how my "Mystery Box Probability" activity became a "Mystery Bucket." I decided to use my ever-handy linking cubes (affiliate link) for my mystery items. That view, however, was NOT visible to my students. I carefully guarded the bucket throughout the class period so that they could not see the contents. I walked around the room and gave each student a turn drawing a block from the bucket. After the class recorded the color on their tally sheet, the student returned the block to the bucket. Once each student had a turn, I asked the class if we had enough data to make an informed decision. Each class agreed that the more data we had, the better. After the class decided we had sufficient data, we calculated the experimental probability of drawing each color. 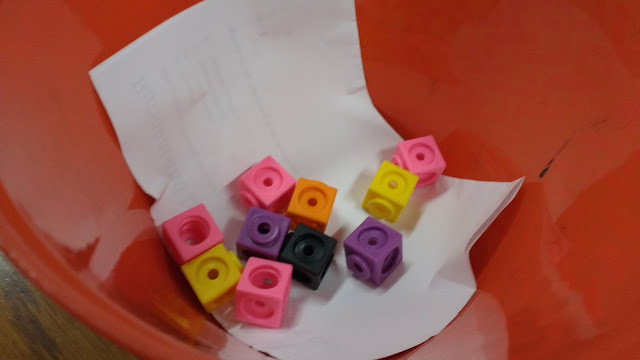 Then, we multiplied the experimental probability of each color by the number of blocks in the bucket. Having never done this activity before, I wasn't sure exactly how well it was going to work. 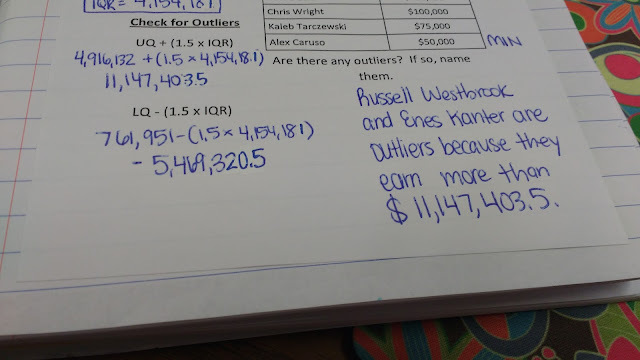 But, I figured even if our estimates were way off, it would still teach my students something about probability. After our predictions were recorded, it was time for the big reveal. Instead of just showing them the contents of the bucket, I removed the blocks one at a time. I wanted to make the anticipation slightly painful for them. I drew it out as long as I could. One of my classes had all five of their predictions wrong. That class unfortunately had a tendency to draw that black block from the bucket over and over and over despite it being the only block of its color in the bucket. This really threw off their data! My other two classes each got one or two colors spot-on. The other predictions were close but not exact. We discussed how we'd need to collect a large amount of data to arrive at a more accurate prediction. All in all, I really enjoyed using this activity with my students. I will definitely use it again next year! File for this activity is uploaded here. Algebra 1 is in the midst of our LAST unit of the year. With the stress and craziness that comes with testing + end of year activities, I'm trying hard to make our probability unit as interactive and fun as possible. Many of the other teachers in the school have resorted to Netflix for their lesson plans, so it's a struggle to get my kids to do anything. 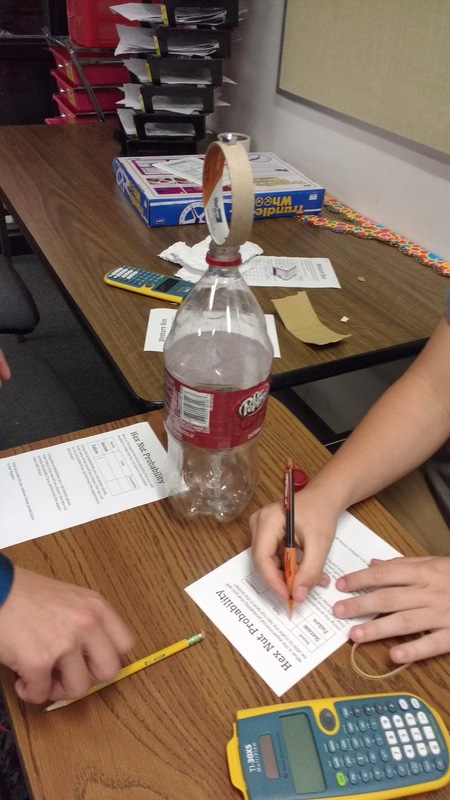 Oklahoma's new standards for Algebra 1 focus on experimental probability instead of theoretical probability. My husband recently reminded me of a probability activity I had used with 8th graders when I was a student teacher. Natalie Turbiville calls the activity "Beano" on her Walking in Mathland blog. As a student teacher, I decided that beans and middle school students were not a good combination. So, I played the game with some counters and didn't exactly give it a name. In fact, my first blog post about the activity was titled "The Probability Game Without a Name." 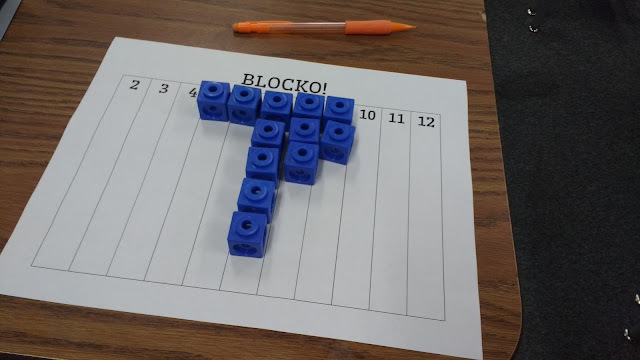 This year, I decided to rename the activity to "Blocko!" This name was inspired by the fact that I gave students "blocks" as game pieces. 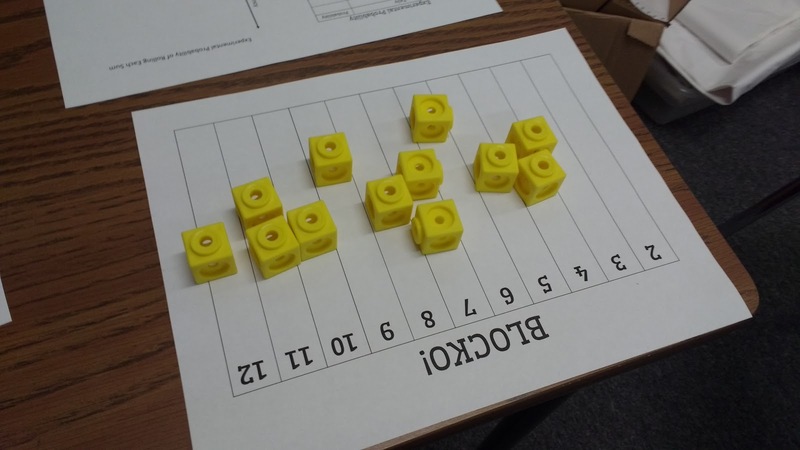 I used one of my favorite classroom manipulatives - linking cubes (affiliate link)! I created a quick game board for my students to use. Each student received 12 linking cubes (affiliate link). 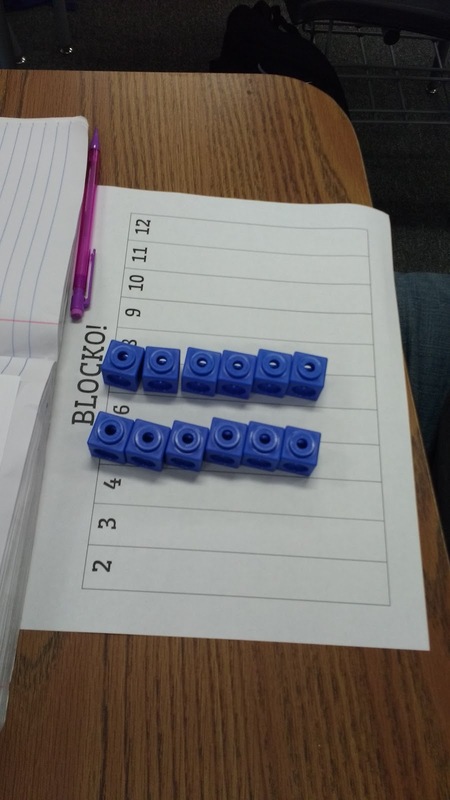 Students were instructed to place their 12 blocks on the numbers of their choosing. 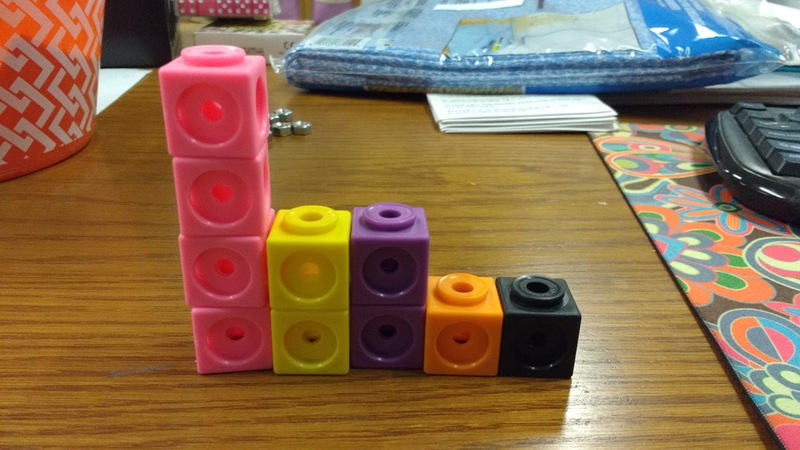 I told students that they could place all of their cubes on the same number or different numbers. It was interesting to see just how creative they got with their arrangements. 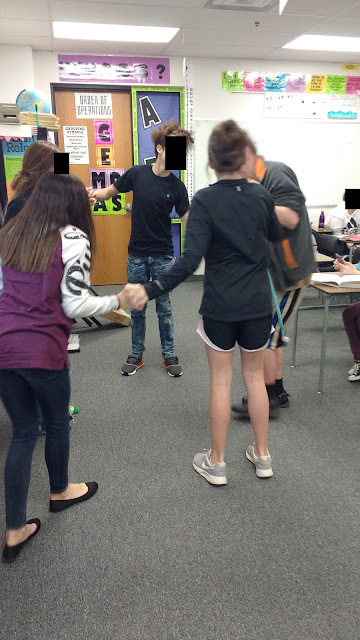 At this point, I still had not explained the point of the game to my students. Some of my students were VERY stressed out that "1" had been left off of the game board. I took this as the opportunity to explain what the numbers on the game board represented. The premise of the game is quite simple. 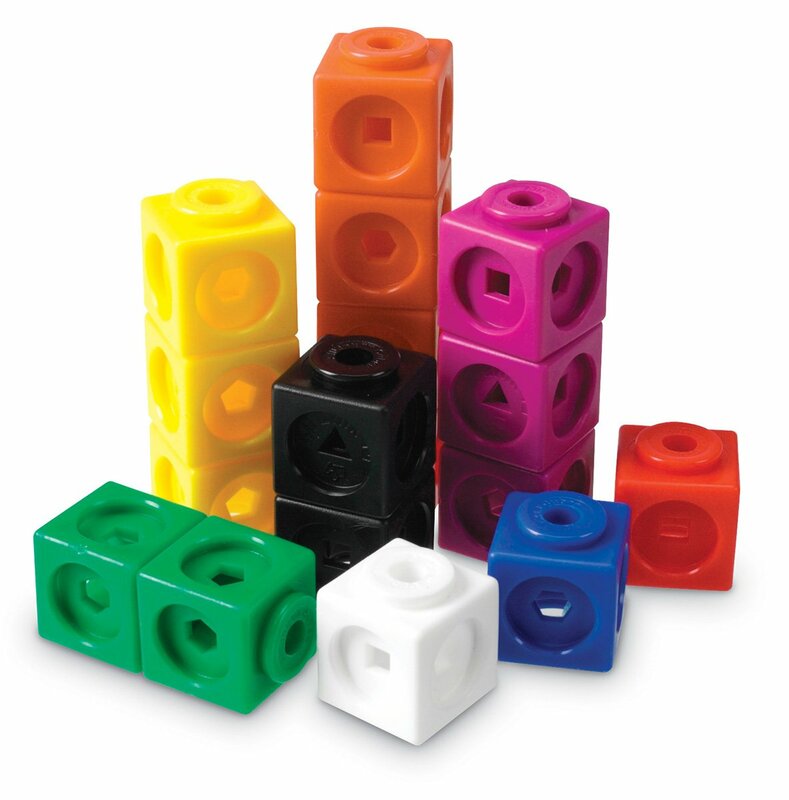 I will roll two six-sided dice, and I will announce the sum of the two dice to the class. If the student has a block on that number, he/she may remove exactly one block from that space on the game board. If a student has multiple blocks on a certain number, he/she must wait until I have called that number multiple times to remove multiple blocks. The first student to clear his/her board and shout "Blocko!" is the winner. After explaining the game's basic rules, I gave students one last chance to make modifications to their game board. I figured this was fitting since I had instructed them to place their blocks on the board before explaining the rules! 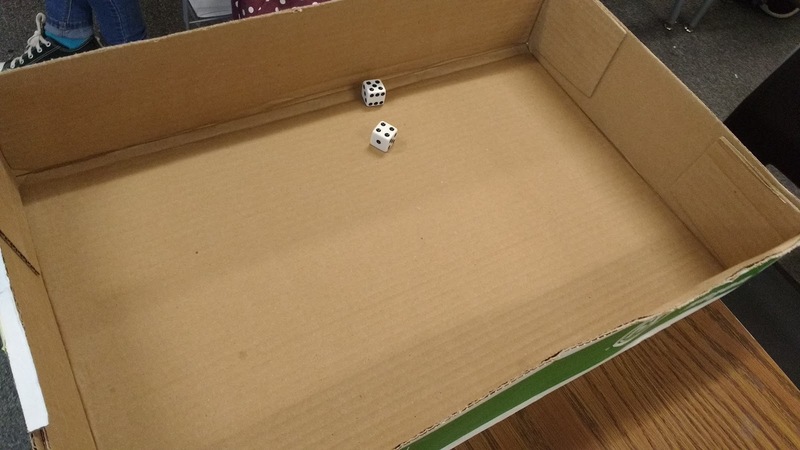 I used a lid to a paper box to keep my dice from escaping between rolls. 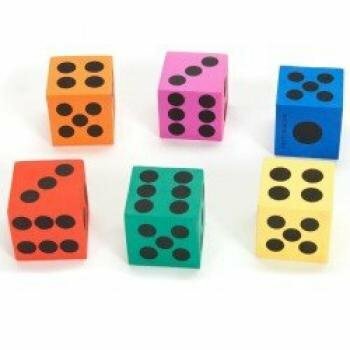 With an earlier class, I used my large foam dice (affiliate link), but I ended up getting quite the workout chasing them around the room! 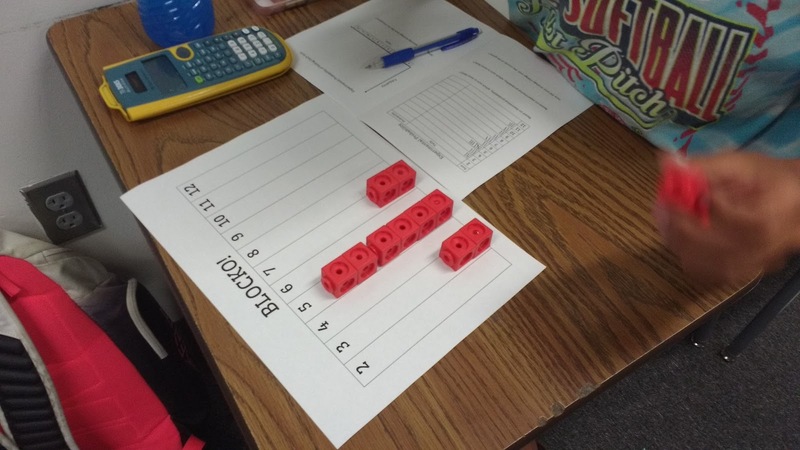 After each roll of the dice, students removed a block, if possible, and made a tally in their notebook. I created this sheet to help my students calculate the experimental probability of rolling each sum. As we progressed through the rounds, students' game boards slowly started to shift from the block on every single number stage to blocks in the middle of the game board stage. After playing multiple rounds, my students counted up the number of dice rolls and calculated the experimental probability of rolling each sum. The students recorded these probabilities on the table in their notes. 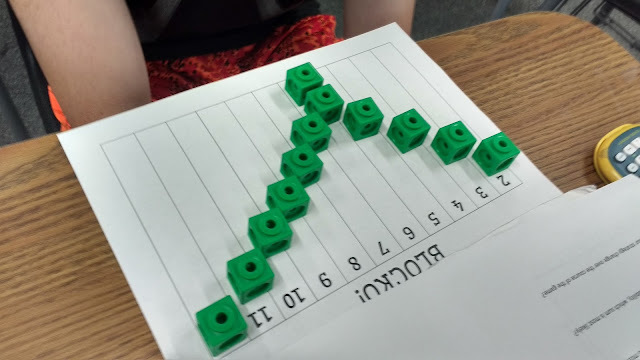 Then, I had students make a frequency chart. 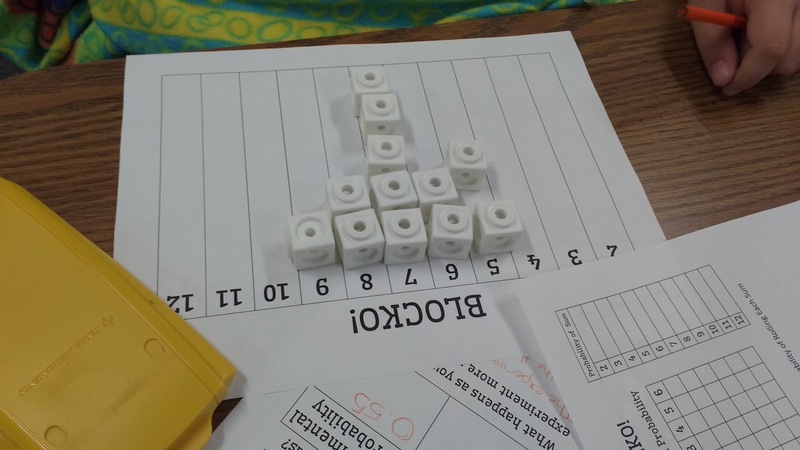 After experiencing the experimental probability of this game for themselves, I had my students investigate the theoretical probability behind the game. First, we had to complete a chart to find all of the possible sums that result from rolling two six-sided dice. 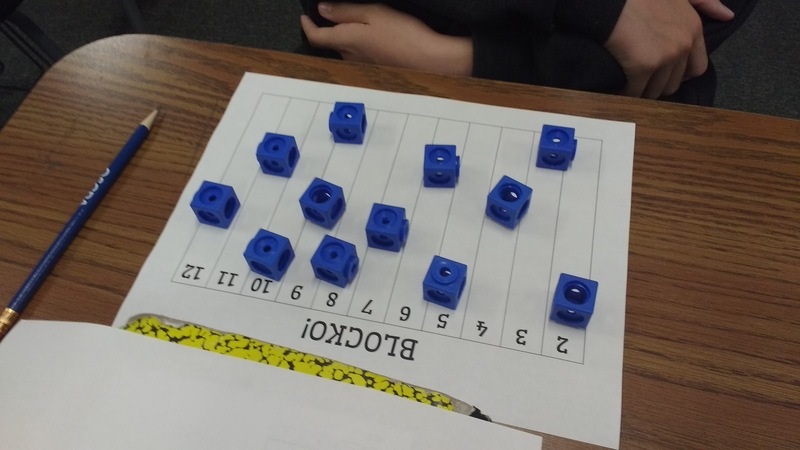 Then, my students used this chart to help them calculate the theoretical probability of rolling each sum. We compared the the theoretical probabilities we had calculated to the experimental probabilities we had found. It was super exciting to watch my students realize WHY the dice seemed to keep giving them the same sums over and over and over. We ended the activity by answering a few questions that I borrowed from the worksheet on the Walking in Mathland website. Here's a link to the game board and probability charts I created for students to glue in their interactive notebooks. 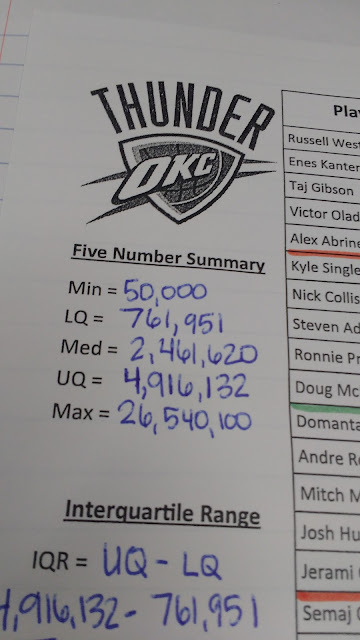 Today's lesson is brought to you with special thanks to the OKC Thunder. 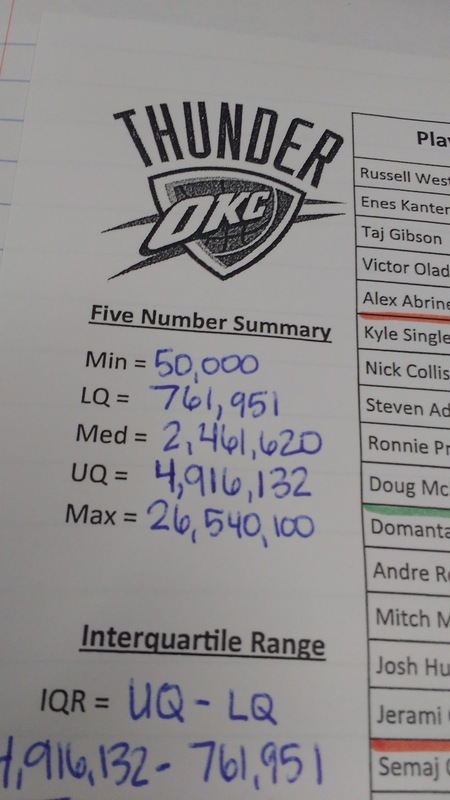 I chose to use data for the OKC Thunder because they are Oklahoma's only professional sports team. Oklahoma is just a little bit obsessed with them! 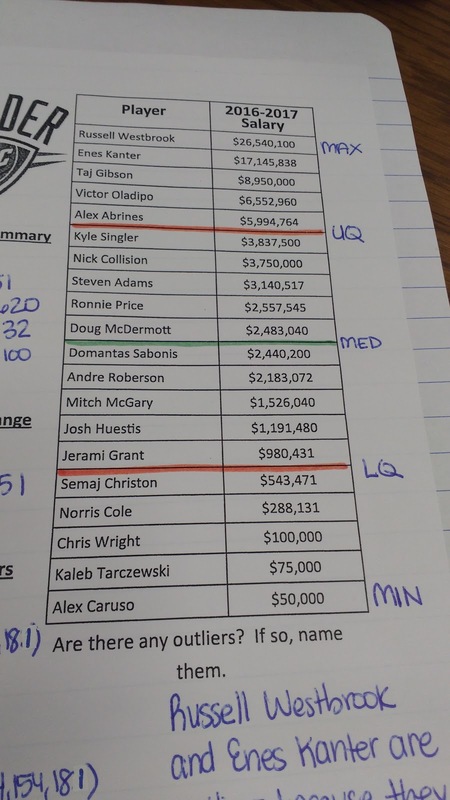 I got the salary data from Basketball Insiders. When my students started looking at the data, they were shocked that I had been able to find that data on the internet! Up until this point in the course, the only way my students knew to identify outliers was to eyeball them. This was really frustrating my students, and they kept begging for a more definitive way to see if a data value was an outlier. 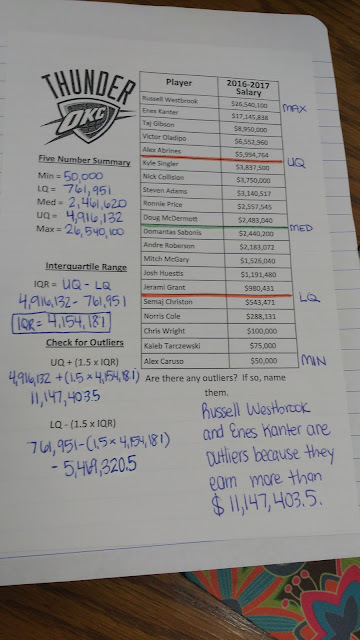 I LOVE that my students were begging for a method for identifying outliers. I need to find more ways to make my students BEG for solutions in math class! Before spilling the beans and telling them how we check for outliers, I asked the class to discuss who they thought must be an outlier. 100% of the class was absolutely sure that Russell Westbrook HAD to be an outlier. Some reasoned that Enes Kanter must also be an outlier since there is such a big gap between Taj Gibson's salary and Enes Kanter's salary. Others were not so sure. Then, the conversation got super interesting when someone suggested that we might also have outliers on the lower end of the data. This was even more controversial than the conversation regarding Enes Kanter! I had to stop the debate and get my students started on finding the five number summary. This was my students' first time ever finding the five number summary for a data set. Finding the minimum, median, and maximum were a breeze. 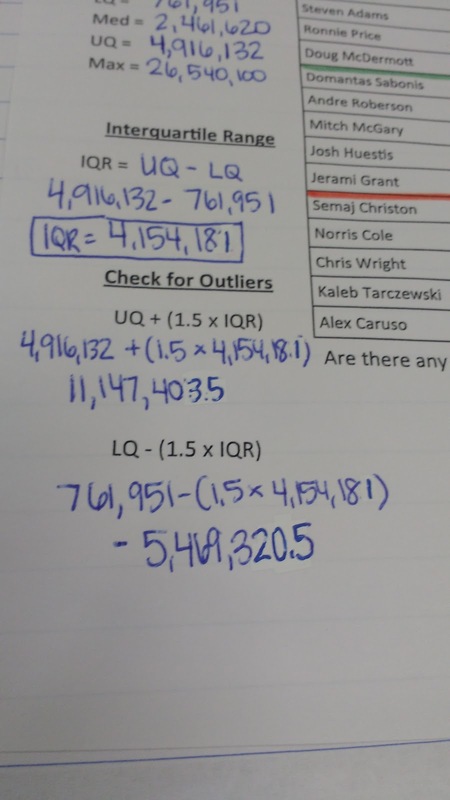 Students were a bit confused by lower quartile and upper quartile, but that confusion was quickly cleared up. Next, we found the interquartile range. I must have jumped too quickly referring to the interquartile range as IQR because when my students took their quiz, I got asked way too many times what "interquartile range" meant. As soon as I said "IQR" they knew exactly what to do and got right back to work. Oops... Maybe I should only call it "interquartile range" in the future until students beg for an abbreviation! Defining outliers as being more than 1.5 IQRs outside of the upper quartile and lower quartile results in two outliers: Russell Westbrook and Enes Kanter. 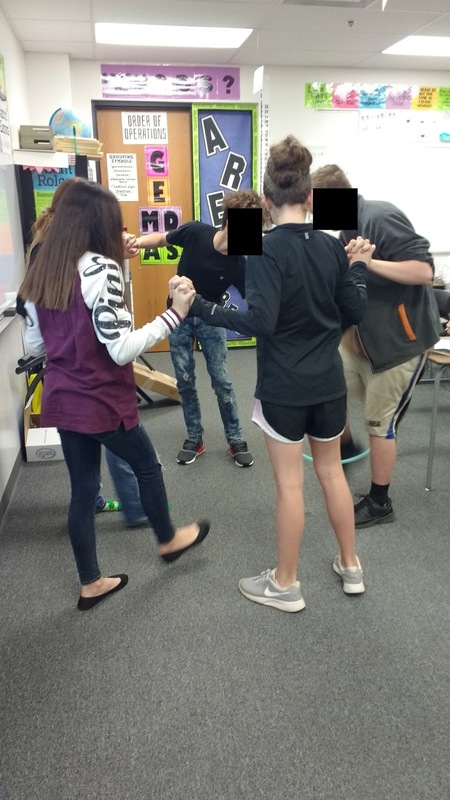 My students ended up being engaged throughout this activity. They seemed genuinely interested in finding out which players were outliers. One student begged me to look up data for other sports teams for their quizzes. He said that if I used his favorite teams I would be his favorite teacher ever! Files for this lesson are uploaded here. How well can you estimate 30 seconds? Five Years: Where has the time gone?